We go through a lot of spinach in our house. Almost all the juice I make has some spinach in it, and I also make a lot of spinach salads. But because I have been eating a lot of spinach salad lately, I had gotten a bit bored with it. I remembered that I used to make a warm spinach salad. Basically, I saute some onions and add olive oil and balsamic vinegar to the still warm pan to make a warm dressing. Then I pour the warm dressing over the spinach, which slightly wilts the spinach leaves. I usually top the salad with a poached egg. Saute the onions in a bit of oil until they are soft. Then add one part olive oil and two parts balsamic vinegar as well as salt and pepper to taste. Pour the warm mixture over the washed spinach. Toss with Parmesan cheese to taste. Top the salad with a poached egg. i love having eggs in my salad, poached egg is such a wonderful idea! I have been eating a lot of spinach this week! I just bought a ton form Whole Foods for some reason, so I'll have to try this recipe. I need to practice my poaching skills a bit more. Favorite Halloween candy: Reece's PB cups! By far. 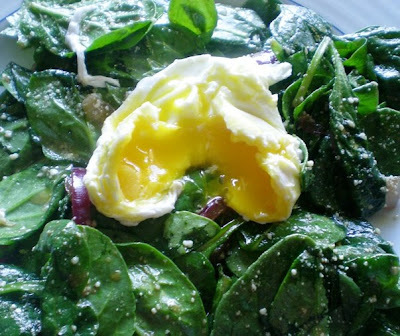 i' ve nevr had a warm spinach salad or eggs in my salad - it looks yummy and sounds great! Reese's cups too! I'm slightly addicted... or mini snickers... amazing. I have never had a poached egg on a salad, but I've always wanted to try it! I'd never thought of a poached egg on my salad. But I love hard boiled eggs, so I'm sure this would be even better! I may have to try it! As for halloween candy? I love those little peanut butter kisses. Mostly because my grandfather always had them, and she'd keep them for MONTHS afterward to give to us kids. LOL! I lost my comment...somehow...been doing that a lot lately. What a GREAT salad idea! LOVE IT! Delicious! But too bad it reminds me of the poached egg I asked hubby to make me last night. It was a "no". And it's not nice to be rude to hungry people. fav halloween candy issss....good n plentys!! Yum. Spinach sounds good right about now. I actually had some poached eggs a couple days ago. yum!!! I think I'll cook some up for dinner. I love warm dressings on spinach salads - best way to eat them! Favorite Halloween candy: Twix, I do believe. thanks for the insight into blogging, and saying my blog is fun to read! sorry you don't have as much time- sometimesit's better to be out there living life instead of typing away on a blog. favorite halloween candy? well i really dug milky ways when i was a kid- my mom was paranoid i never got to trick or treat! Oooh great idea! We usually have a lot of spinach here but I forget I can add it in with other sauteed veggies! i love mounds bars. i used to horde them outa the basket at my mom's. My favorite Halloween candy is Nutrageous bars. But I haven't been able to find them at Walgreen's for the past two years. Do they not make those wonderful candy bars anymore? SIGH!! That salad looks great! I prefer cooked spinach over raw spinach so I will definitely have to try this. That sounds like a great lunch or light dinner!